It may seem strange to begin this article by saying that nothing spectacular or extraordinary has occurred in the Durban parish, but it is the truth. One loves to hear or read interesting news about the Faith or about the work of Tradition and certainly it is always encouraging, but just as encouraging is the daily work that goes on in a parish, albeit that it does not “make the news'”. Let me give you an example of what I mean. Archbishop Fulton Sheen once asked a young priest how he was managing in his apostolate. “Wonderful, Your Grace,” came the priest’s reply, “I have already converted three people this year”. “Take heed,” replied the Archbishop, “or you will forget that it is the Holy Ghost who is principally at work”. The priest, important though his work is, is a mere instrument, the principal agent is the Holy Ghost. 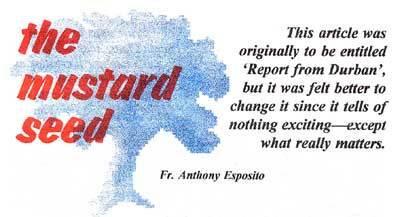 Yes, nothing extraordinary has happened at Our Lady of the Holy Rosary Parish. The priests have not converted all of Durban to Catholicism….yet! So what have we done? Well, in spite of our many failings and failures we have, please God, done our duty of state, no more, no less. Our daily Holy Mass, our Divine Office recited in the name of the Church: these and our other duties seem of no importance in the eyes of the world, yet what is important is how God Himself sees them. You see, the priest’s duty of state is his Holy Mass, is his breviary, is his prayer life, is his preaching, is his dispensing the sacraments to the faithful. Yet none of these duties will make front-page news. The headlines in next month’s Nova et Vetera, Catholic, Southern Cross, will not read “Traditionalist priests in Durban distribute sacraments”. It’s taken for granted, and perhaps even the parishioners of Our Lady of the Holy Rosary Parish, or any parish for that matter, take it for granted. Let’s not take it for granted, though. When the priest offers the Holy Sacrifice of the Mass he “honours God, he rejoices the angels, he edifies the Church, he helps the living, he obtains rest for the dead and he makes himself partake of all that is good” (Imitation of Christ, Bk. 4, Chap. 5). And so it is in a similar vein with all the sacraments. We have baptized, beard confessions, blessed marriages and buried our dead….our duty of state. True, we have had ten adult converts in the past two years. We are the instruments, the Holy Ghost is the principal agent ….our duty of state. One of the priests recently went to give a parishioner Holy Communion in an old people’s home. Whilst there he was told of another man, a Catholic, who was in extremis. The priest was able to give the man the Last Rites and the Apostolic Blessing in the hour of death. Ten minutes later the man died. Certainly it was a consolation to the priest to have been able to help this man in the best way possible in the final moments of his life. He was only doing his duty of state. So you see, dear readers, nothing spectacular or extraordinary has happened. What has happened has been ‘supernaturally sublime’ and this, not only here in Durban but in Johannesburg, Pietermaritzburg, Harare and everywhere else where the Society is working.